Don’t buy cards at the store…..
Buying cards for birthdays, holidays, and special occasions at the store can be very costly. I have recently been introduced to a method of sending professional quality cards through the mail (not e-cards) for less money, which is also more convenient than shopping, writing, addressing, and sending traditional cards. You can choose from hundreds of existing designs, or create your own design with photos from your computer. You don’t need to print them, stuff them or send them. All this is done for you at a lower cost than a traditional card bought from the store. Send one card, or send 100. Quantity doesn’t matter. Whether you send cards to personal friends or business associates, this is a fantastic way to let people know that you are thinking of them. Sending cards is something we can do to have a significant impact on the lives of family members, friends, business contacts or even strangers. Many people have a desire to send a card to people several times a month for various reasons (sympathy, birthday, anniversary, etc.). More often than we would like to admit, the card does not get sent. We struggle to find the time. We don’t get to the store. We forget. The cost of the cards is high. We aren’t thrilled with what the inside of the card says. There are many obstacles. There is a movement going on in our world toward computer based services. Sometimes we aren’t sure if it is a good thing or not, but it is becoming an increasing reality. There is always good and bad associated with change. What did Netflix do to the video rental industry, Amazon do to the bookstore industry or itunes do to the music store industry? People are getting used to getting products and services online. So, let’s revisit the need to send cards for different occasions. A company I have discovered is revolutionizing the greeting card industry. That company is SendOutCards. 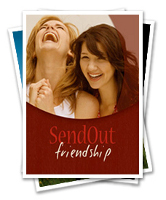 It is an online greeting card and gifting company. Imagine being able to pick a card from a virtual card store, personalize the message on the inside, and send it for less than a third of the cost of a card purchased at the local card store. Imagine doing this from your home, office, coffee shop or even the beach. With the click of a button a card can be sent in a matter of minutes. The card is printed, stuffed in an envelope, stamped and taken to the post office by the next morning. Because of this cost and time savings, it is possible to send cards more frequently. It has a positive effect on the recipient and creates a positive feeling in the sender as well. There is so much more that can be done with this system, but you can explore and find that out if this has aroused your curiosity. I have found it to be very helpful in my day-to-day need to reach out to people, and I am now using it to help market my business. Click on the image below for more information. This will link you to the site of a friend of mine who is in the business. You can test drive the system at no cost!! There is also an income opportunity with this company and product if interested.